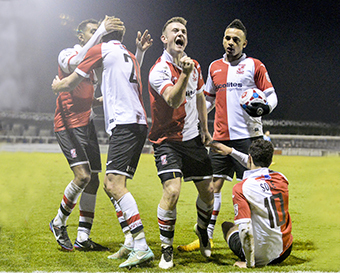 WOKING have pulled off an early coup in the January transfer window by re-signing two of this season’s key players. Young forward Jack Marriott and wide man Chris Arthur had both come to the end of their loan spells, with the pair due back at their parent clubs – Ipswich Town and AFC Wimbledon respectively – after New Year’s Day’s 1-1 draw with Eastleigh. Buoyed by Cards’ excellent first half to the Conference and FA Trophy campaigns however, it would appear as if chairman Mike Smith and manager Garry Hill have agreed to dip in to Woking’s tight part-time playing budget to re-enlist the services of two of the squad’s mainstays – subject to FA and Conference ratification. Incredibly, this latest loan deal for Marriott marks the pacey player’s fourth separate stint at Kingfield in the past two seasons. The 20-year-old hot shot has netted 18 goals over his first three spells. But such is the trust that Ipswich boss Mick McCarthy clearly has in Hill and Smith to provide the competitive Conference action that Marriott craves, the Tractor Boys have once again given the green light for Marriott to add to his senior goals tally between now and April 25. A caveat of the deal however, is that due to being a youth loan deal for an academy player, Championship side Town do have the option to recall the young player at 24 hours notice, should they wish to do so. Like Marriott, winger Arthur, 24, has also signed on until the end of the current campaign. Having now been released by Womble’s boss Neal Ardley, the pacey Arthur has been snapped up on permanent terms for the remainder of the season. An almost ever-present in Garry Hill’s starting XI this term, Arthur has made 26 starts and two substitute league and cup appearances. Initially brought in as cover for the injured Kevin Betsy down the left flank, Arthur has carved out himself a regular spot on Hill’s team sheet as a converted full-back. With John Nutter no longer regularly available due to work commitments and Mike Cestor’s knee injury prognosis as yet unknown, it would seem as if there are a few more fixtures still to fill down at Kingfield for the Wimbledon man. Meanwhile, midfielder Theo Lewis, has joined big-spending Conference South side Ebbsfleet United for an undisclosed fee, having only signed on at Kingfield in the summer from Salisbury City.